I like layers - layered cakes like kek lapis, layered jellies, mille feulle etc The visual contrast between the layers can be stunning. But making layered cakes is a very tedious affair, heck making anything with layers is tedious. Long hours slaving over the oven waiting for each layer to bake out or set before doing the next one. While searching for something stripey to make, I had stumbled upon Anh's Foodblog and decided I was going to take up the layered bread challenge. 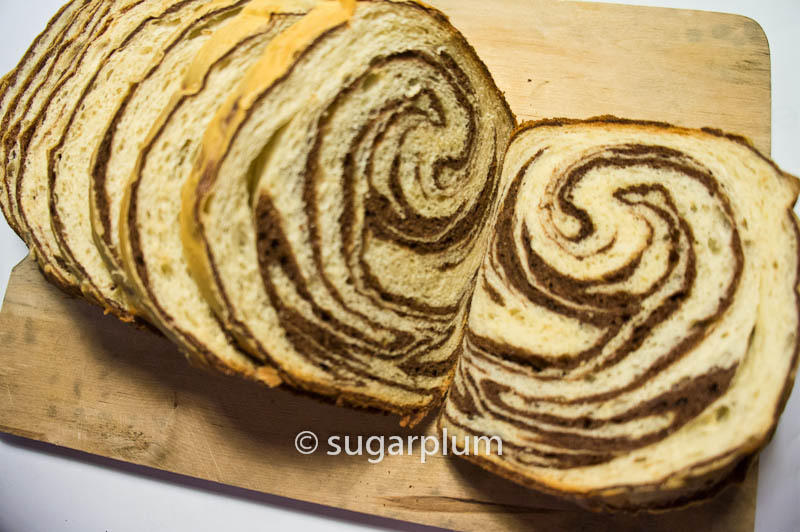 I'd also seen what looked like swirl breads being sold in bakeries and they looked very pretty indeed. This is actually my 2nd attempt at making this. My first attempt used a Hokkaido milk loaf recipe which produced a very wet slack dough and I had to make substantial improvisations on the spot to salvage the bread. It turned out well considering and I had beautiful layers, but the bread was a little tough and chewy. Like a baguette. Not at all like a Hokkaido Milk Loaf. This time, I decided to use the same folding technique but changed out the bread recipe to something tried and tested. The honey oat bread recipe which I'd posted on before. This gave me a beautiful soft bread with chocolate layers. You'd be surprised at how easy it is to make the layers. You just need to spend about 10 minutes rolling and folding the dough, and once you get the hang of it, it's a piece of cake (or dough). It was good enough to eat on it's own because of the lovely chocolatey addition. Served with homemade almond butter and it's almost like Nutella bread! Makes 1 loaf 9" x 5"
1. Prepare the chocolate layer - melt the chocolate in a microwave by zapping it for about 40 seconds on high. Then stir in the cocoa powder until mixture is smooth and has no visible lumps. Set aside until ready to use. 2. 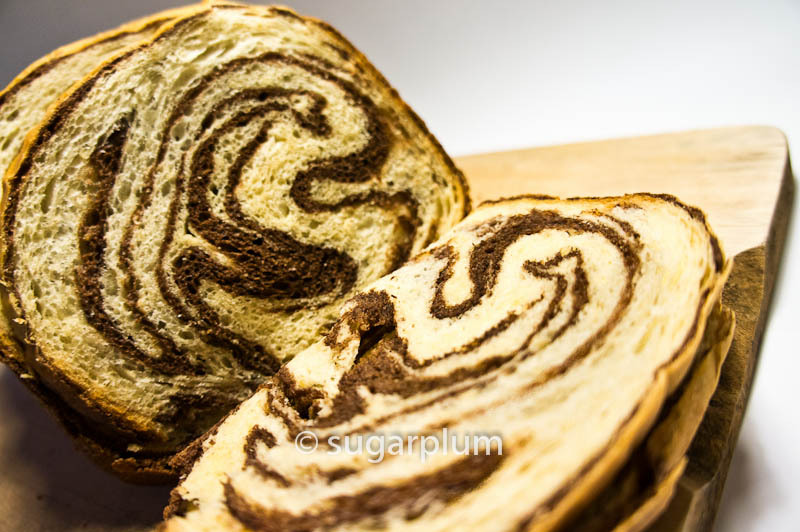 If using a bread machine, put in all the liquid ingredients first before adding the dry ingredients. Use the dough mode to knead. 3. If kneading by hand, pour the liquid ingredients to the dry ingredients and mix until it comes together to form a soft dough. Knead until the dough is smooth and elastic. 3. If the dough is still very wet and sticky after 5 minutes of kneading, add more flour, 1 tablespoon at a time, until the dough is barely tacky. If the dough is too dry, add water, 1 teaspoon (5 ml) at a time, to soften it up. 4. Once the dough is smooth and elastic, remove about 1/4 of the dough into a separate mixing bowl. Knead in the chocolate mixture. 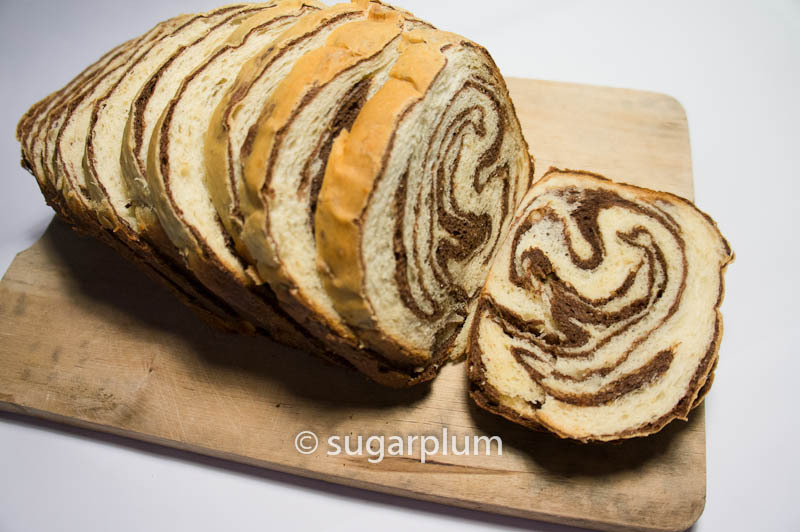 It will take some elbow grease to incorporate the chocolate into the dough. Have some patience. 5. Place each portion of the bread dough separately in lightly oiled bowls, cover, and allow to rise until doubled, about 1-1 1/2 hours. 6. Once doubled, place the plain dough on a lightly floured surface. It’s time to shape the dough. 7. 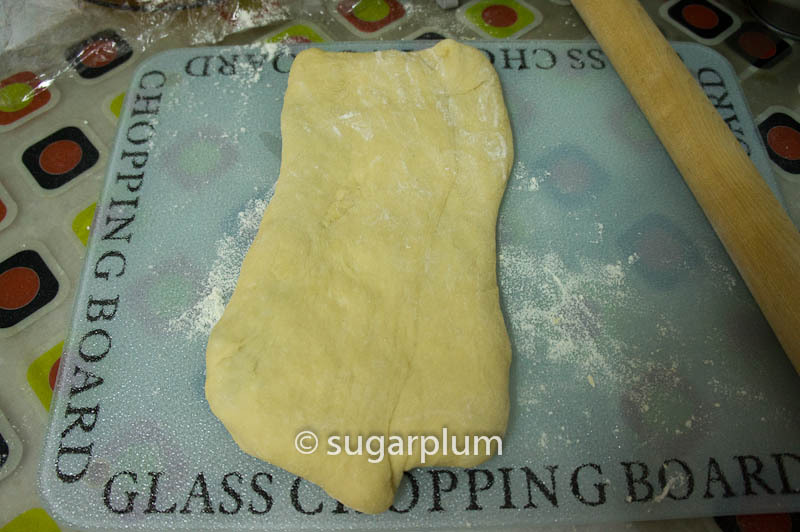 Gently punch the plain dough down and with a rolling pin, roll the dough out into a rectangle approx. 9”x12”. 8. 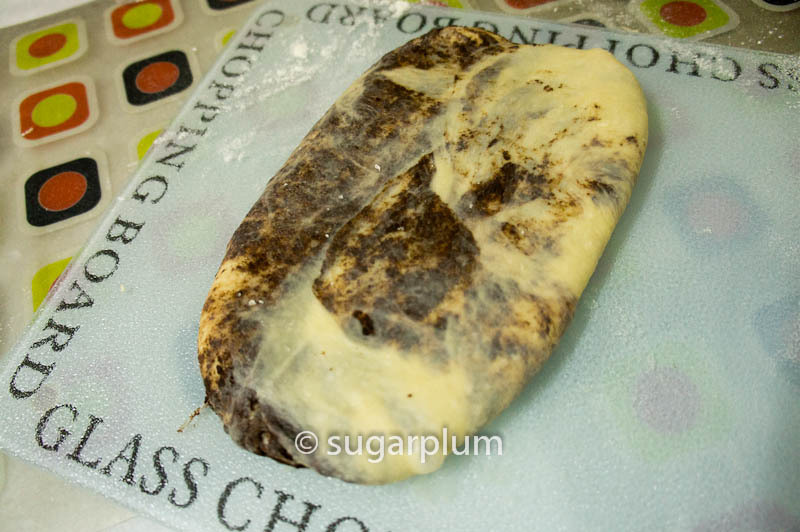 Do the same for the chocolate dough, but roll out into a smaller rectangle approx 7"x 10". Place this on top of the plain dough. The chocolate dough should be well inside the plain dough. 9. 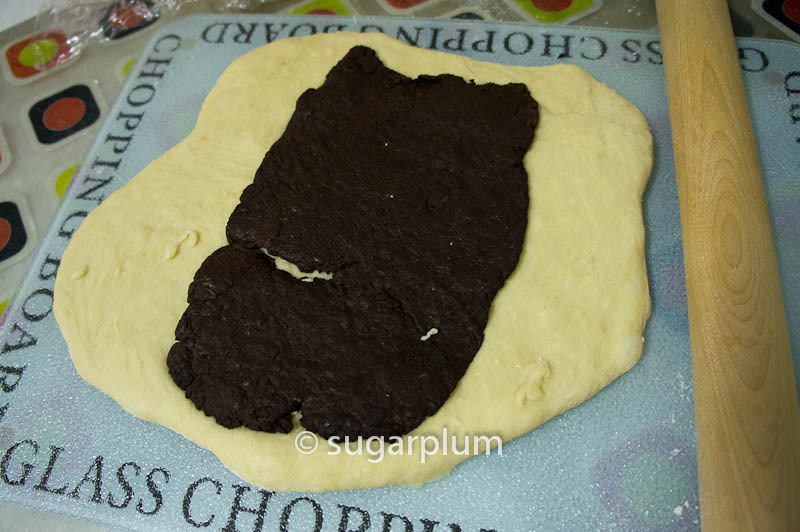 Fold over the plain dough (top, sides, bottom) to cover the chocolate layer. Pat it flat so that it's easier to roll out next. 10. 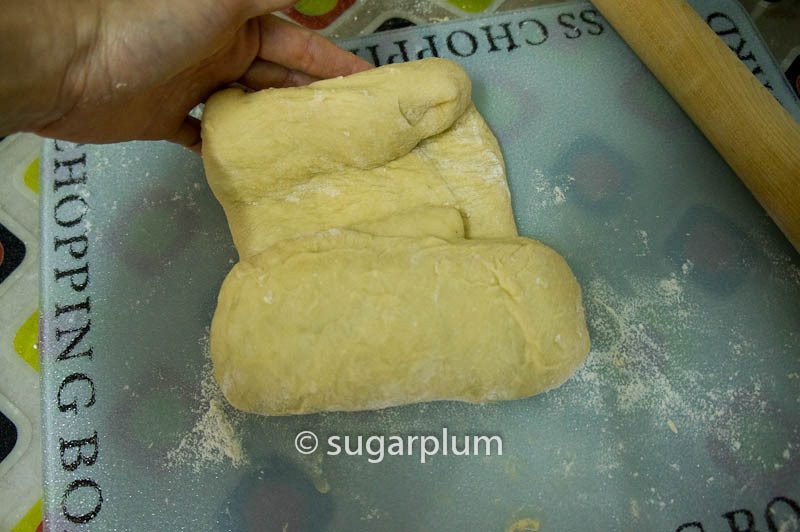 Roll the dough into a rectangle shape, and fold the dough in three lengthwise. 11. Turn the dough 90 degrees and repeat step 10. Roll the dough out into a rectangle and fold over into threes. Turn. 12. The more turns you made, the more layers and marbling you'll get. I turned it about 5 times only as the layers were becoming quite thin. 13. At the final rectangle, roll the dough up like a swiss roll into a loaf and tuck in the sides neatly. It is now ready for the 2nd proof. Place the shaped dough into a loaf pan, cover with a clean towel and allow to rise until doubled, about 1 - 1 1/2 hours. 14. Preheat oven to 350 F (180 C). 15. When the shaped loaf is doubled, place the bread in the oven and bake for 40 to 50 minutes, until the bread is deep golden brown and the internal temperature is about 190F. 16. Transfer to a wire cooling rack and allow to cool completely before slicing. 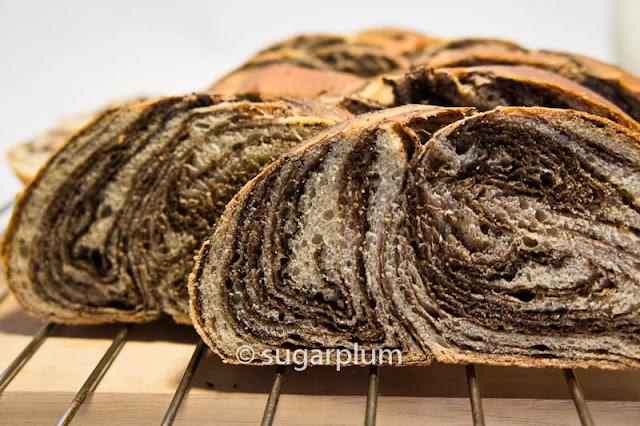 You can choose to braid the loaf - here's the link to the folding and braiding instructions in Anh's Food Blog. The braided version did produce a more marbly-layered effect. Depending on the humidity, you may have to add more flour or more water to the bread dough. I find that I have to add more flour due to the high humidity in my kitchen.